The tradition of Shakti worship in India can be traced back to the period of antiquity. Shakti is the mother of Universe the highest primal power transferred to powerful Goddess representing the creative force, Matrika, later developed to Shakti or Prakriti under various names of Sati or Devi (Durga / Parvati)ad depicted in Purana-etihasa and Tantra literature. Worship of Shakti , as a pan -Indian phenomenon , predates Sanskrit influences of every kind. 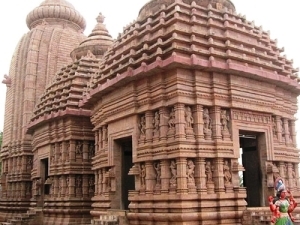 There are a number of important Shakta centers in India Among those Odisha has been considered to be one of the most important Shakti centre and Tara-Tarini at Kumari hills on the bank of River Rushikulya near Purushottampur in Ganjam District is one of the most ancient Shakti pithas of Odisha. God Tara-Tarini have been regarded as the presiding deity(Ista-Devi)in almost every house in South Odisha. This important and famous Shakta Pitha is situated on a hill top at a distance of 30 Kms towards north of Brahmapur on the south bank of river Rushikulya. The height of the hill is approximately 708ft. and the total area spreading over 180 Acres of land. The hill is popularly known as Tara Tarini Hills Parvata and is surrounded by natural beauty . The picture scenery of the temple,from the hill top down to the bank of river Rushikulya gives imges see pleasure and a thrilling experience of nature and divinity to each pilgrim - visitor and often captivates its mind and soul. There are 999 steps on the front side of the hill leading to the temple and also a pucca road for vehicle on the backside of the hill facilitating devotees to reach at the Pitha. Provisions of electricity, drinking water and a small market complex at the site with articles of puja /archana are additional features of this Pitha.